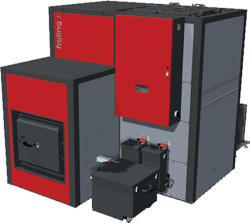 The TI from Froling combines the advantages of industrial-grade parts with a compact design and offers exceptional quality. Made of highly heat-resistant refractory fireclay, the combustion chamber adapts very quickly to different performance requirements. This rapid adjustability is particularly beneficial for dry to moderately damp fuel classes.